Have you ever thought, if only I knew how to take such good photographs, I could start my own photography business? Maybe, not many of you thought that. I love photography; I hop onto any photography article, especially the ‘Beginner’ ones. That’s the reason why I frequently visit Digital Photography School. A few months ago, in my pursuit to learn more about photography, I bought a course in Udemy. Initially, I thought it is just a simple beginners course. To my surprise, the course was a very comprehensive one with so many tips and information. I totally loved it. And the best part, it was definitely more than it’s worth. 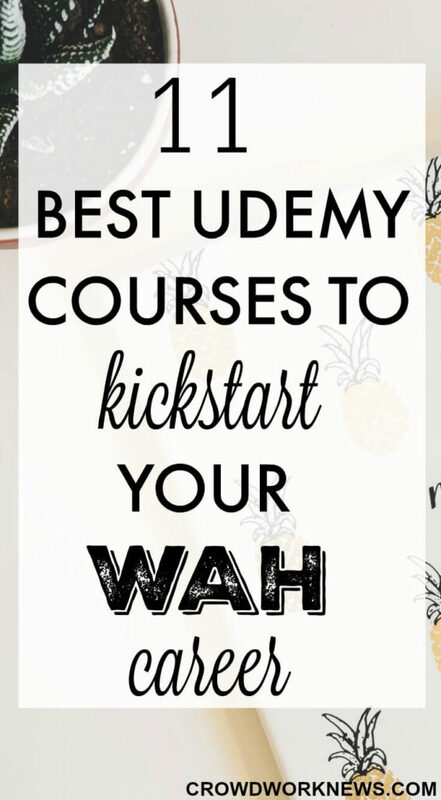 I believe that Udemy is a goldmine for work from home hustlers or even people like me who are looking to take their hobbies to another level. It has a wealth of information for starters to learn and enhance skills to begin their work at home journey. The cool part is, Udemy is full of courses from renowned tutors. I have curated a list of courses which might be useful to develop a hobby into a side business or learn more about the freelancing gig which you might be doing already. At the time of compiling this list, the prices of these courses were on sale. Please check the website for their current prices. The good news is, Udemy has sales most of the time. So, keep checking. Selling on different platforms like eBay, Amazon and Etsy are hugely profitable even for starters. Making money with Amazon FBA is a recent favorite which is a comfortable and flexible option for many who work from home. There are many courses which teach the basics of selling on these platforms. This course teaches how to start your Etsy business from home and also market your products on social media. It covers many aspects of selling on this platform like taking good photos, how to contact manufacturers and what social media platforms might be good for the business. This course is rated 4.5 and 2,556 students are enrolled in it. A widely popular course which teaches about drop shipping business in detail and everything about how to start it on eBay. The course has a very detailed curriculum of 87 modules. This course can be a good starting point for your eBay drop shipping online biz. This course is rated 4.7 and 16,109 students are currently enrolled. Website Design is more on the technical side, but nonetheless, this online business is very rewarding and is in much demand. Website designers work mostly as freelancers and can get good amount money. This course is ideal for someone who wants to kickstart their web design business, and it can be a good starting point to get into the web designing biz. This course is rated 4.6 and 1,029 students have enrolled in the course. Social Media Manager role is becoming popular as the need to promote a business has increased and social media is where all the action is. Social media consultants get paid well, and there is going to be a growing demand for this role. James Burchill teaches this course. He is a certified marketing automation coach and a productivity consultant. This course caters for beginners and covers many aspects of becoming a Social Media Manager. This course is rated 4.5 and 3,675 students are currently enrolled. Virtual Assistant business is booming right now. I am sure there will be more and more demand for VA’s in coming times. If you are confused about the services you can offer as a VA, check out this Gina Horkey’s FREE massive list of 150 VA services. This course gives a good overview of the virtual assistant business, lets you assess if this business is for you, set your rates and more. Tina Marie Hilton teaches this course. This course is rated 4.4 with a current enrollment of 193 students. By now you all know, I totally dig photography. I even took a couple of classes and sold some photos. I firmly believe that if you are interested in photography, then you should invest in learning the tricks. If you are good with your skills, then this can be a very fetching biz. Here are the courses which might be useful for you, if you are a shutterbug like me. Charlie Borland teaches this course. He has been a professional photographer for over 30 years. This course is pretty detailed and has many modules right from the introduction to the basic photography to marketing your photos. This course is rated 4.6 with a current enrollment of 5,352 students. Food photography is a very profitable niche, and this course teaches the basics of taking excellent photos of food. It covers many aspects of food styling, scene composition, photo shooting and image processing. Andrew Olson is the instructor of this course. This course is rated 4.6 with a current enrollment of 2,558 students. Online tutoring is a very profitable niche. If you are interested in teaching, then you can easily make courses online in the area you are interested in and make enough money. There are many tools like Teachable, Screenflow to help you create your online course. This course not only teaches about how to make an online course but also goes in depth about the marketing part of it. Miguel Hernandez is the instructor of the course. This course is rated 4.3 with a current enrollment of 8,037 students. This course teaches students to make earrings, bracelets and necklaces. This is primarily a course for beginners and is quite popular on Udemy. Taking this course can be a good stepping stone for your home based jewellery business. This course is rated 4.8 and 1,235 students have enrolled in this course. This course covers the basics of T-shirt printing business like the process involved, equipment needed. It is a very basic course which might give you an idea about this business. This course is rated 4.6 and 912 students have enrolled in this course. This is a fun course teaching how to sell gift cards as a part-time or full-time gig. It teaches techniques and strategies to sell gift cards. This course is rated 4.4 and 2,646 students have enrolled in the course. There you go, this is a simple list of some profitable online businesses you can have. I firmly believe, you should learn to earn, or take your skill to another level. Time to start learning now!! Have you taken any courses to elevate your online biz? Please share in the comments.